Late last week, attorneys for Station Casinos filed an appeal in the District of Columbia US Court of Appeals. The Las Vegas casino operator argues that the union “engaged in objectionable conduct” during its efforts to unionize the property. A locals casino, Green Valley Ranch is located southeast of the Strip along the I-215 Las Vegas Beltway. Along with a 495-room hotel, the casino offers 2,262 slot machines and 48 table games. It’s been more than a year since 78 percent of Green Valley Ranch workers approved unionizing and joining the Culinary Union, a labor group that represents chefs and kitchen workers, waitstaff, bartenders, housekeeping, and bellmen. But Station Casinos isn’t willing to negotiate, saying that the union didn’t act appropriately during its campaign to convince employees that unionizing was in their best interest. Station Casinos declined to comment on the appeal. The two-day election in November 2017 was supervised by the NLRB. A total of 730 Green Valley Ranch employees participated in the vote. It’s been a busy year for the Culinary Union. In May, the group authorized a potential strike at 34 Las Vegas properties, an event that, though unlikely to actually occur, could have crippled the region’s economy and brought Sin City to a standstill. Estimates projected a walkout at 34 properties involving roughly 50,000 employees would have cost Las Vegas around $45 million per day. 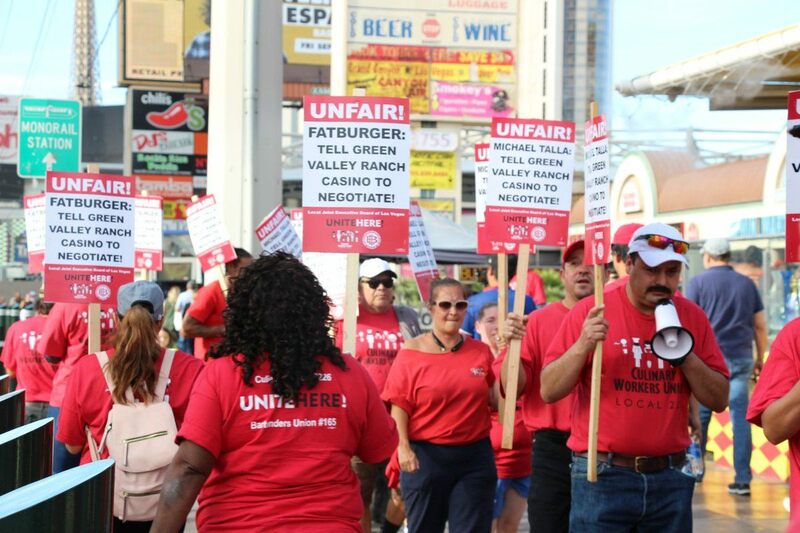 While union leaders had the authority to direct a walkout, casino strikes in Las Vegas are rare. The last occurred back in 1984. MGM Resorts and Caesars Entertainment owned 18 of the properties in question, and when those two companies reached new five-year deals with the union, the potential crisis was largely averted. Along with pay increases, the Culinary Union demanded increased measures to combat sexual harassment, and guarantees from casinos that technological innovations that reduce the number of jobs be shunned. The post Station Casinos Appeals Order Requiring Green Valley Ranch to Negotiate With Culinary Union appeared first on Casino.org.